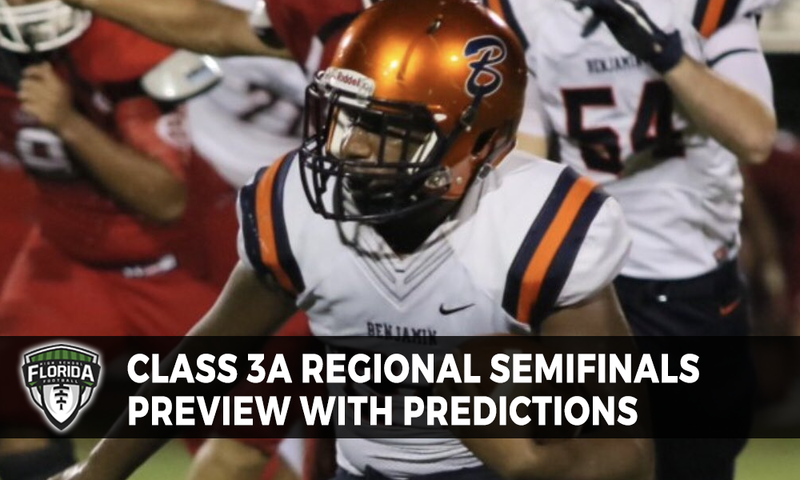 A few upsets in Class 3A last week changed the picture up for the regional semifinals this week, but it is showing that football in this classification cannot be ignored. Here is a look at the eight games on deck this week. This will be the second-ever playoff meeting between the two programs … American Heritage won the only meeting back in 2001, 35-6 that saw the Stallions finish with 307 yards rushing on 41 carries, according to Florida high school football historian, Richard Burton … The visiting Stallions last week easily defeated No. 6 seed Fort Lauderdale Calvary Christian at home, 42-14 … The host Buccaneers were on a first-round bye last week and have not played a game in nearly two weeks, a game in which they lost to King’s Academy in the final seconds for the South Florida Conference Championship … Keep an eye out for the Small brothers of Dallis and Deion who are both threats in the back field for American Heritage … With Benjamin keep an eye on quarterback Santino Marcucci who has thrown for over 1,400 yards this season and has completed 17 touchdown passes. Marcucci also has seven rushing touchdowns. POLL: Who wins Friday night? The Lion’s Den at Vince Zappone Field, Hollywood.